In the early 19th century, the beginning of photography also lead to new practices in the documentation of historic artefacts and natural objects. To supply the viewer of an image with information on dimensions and the relative position of an object, specific devices like the north arrow and the metric photography scale bar came into use. When Buchwald compiled his Handbook of Iron Meteorites in the mid seventies of the past century, the metric scale bar was on every meteorite curator's desk. Different models can be seen with many of the specimen pictured in the three volumes of the Handbook since the metric bar is the ideal reference scale for any object larger than a man's fist. In the early 19th century, the beginning of photography also lead to new practices in the documentation of historic artefacts and natural objects. 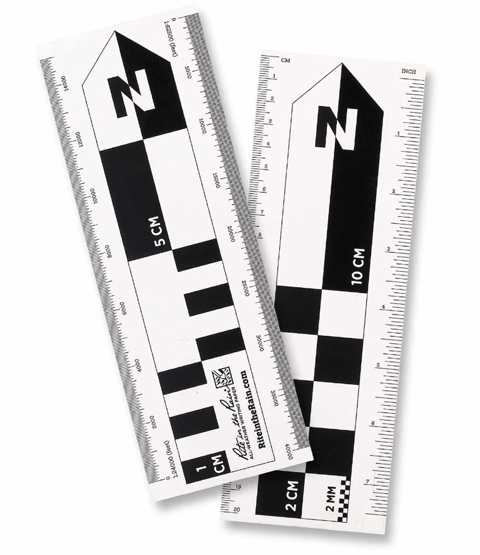 To supply the viewer of an image with information on dimensions and the relative position of an object, specific devices like the north arrow and the metric photography scale bar came into use. When Buchwald compiled his Handbook of Iron Meteorites in the mid seventies of the past century, the metric scale bar was on every meteorite curator’s desk. Different models can be seen with many of the specimen pictured in the three volumes of the Handbook since the metric bar is the ideal reference scale for any object larger than a man’s fist. But there was a certain kind of information the scale bar could not transport. It was limited to a two-dimensional use. 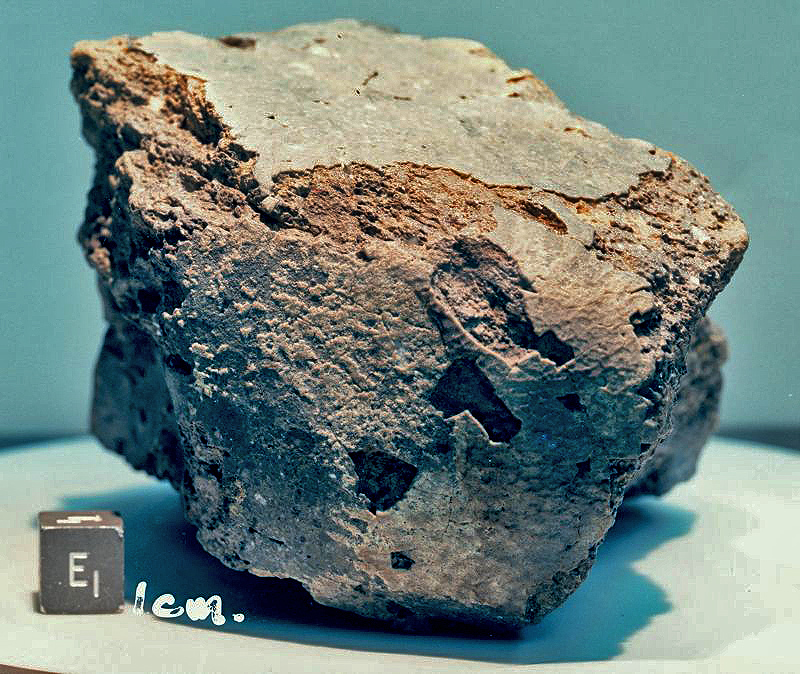 When the same meteorite is shown in a series of photographs one might want to know which surface is the one presented and how it is related to the others. 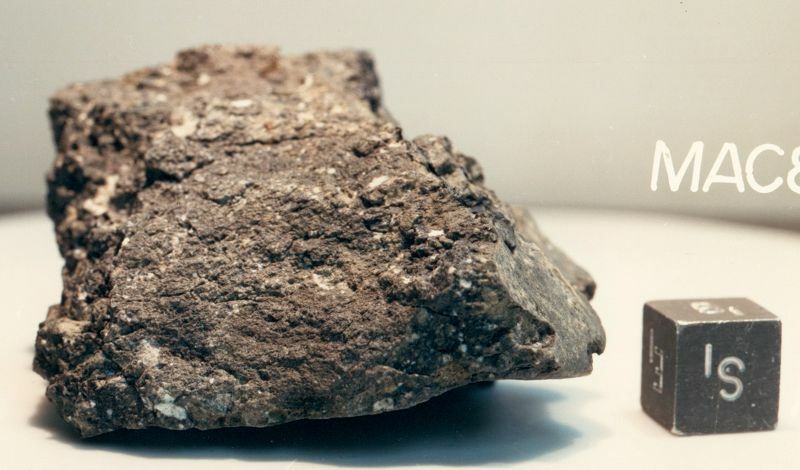 If a meteorite find is photographed in situ, how do we secure information on its relative position? If you have ever been confronted with the task to focus on both – not only the meteorite in situ but also a GPS or a north arrow – then you will know the problem. Like a deus ex machina, an innovation hit the scene that could not have had a greater impact on the conventions of meteorite photography: The meteorite scalecube, calibre 10 mm. Engraved with letters representing both the cardinal points adittionally to top and bottom, the metric scalecube elevated the genus of reference tools into the third dimension. We wanted to know who came up first with the cubic invention, so we asked NASA but nobody there lay claim to the revolutionary idea. More precisely we didn’t receive an answer at all so we must assume that NASA keeps their scalecube files restricted up to the present day. With no access to this vital information, we were forced to push forward our own behind-the-scenes investigation. Scanning through ANSMET archives, we found early photographs featuring scalecubes dating back to the time of the cold war in the late seventies. We have not yet been able to identify the mother of all cubes, but the device displayed in picture 2 is without doubt a very early version. The material seems to be solid metal, engraved letters are approx 5 mm tall and less than 5 mm wide. This version already has the vertical ‘I’ serving as a bottom indicator. The style of lettering seems to be Arial narrow. In the following we will refer to this version as the type A cube. On the other side of the great Pond, NASA’s headstart in meteorite scalecube technology did not stay unnoticed for long. The Russian academy of sciences, known for their effective intelligence, countered the US provocation with ease. Their answer was an easy to operate, technologically less complicated and aesthetically pleasing cube. Instead of Arrial Narrow the Vernadsky team used a plain Arial font. Presumably to save production capacities, they decided to spare the bottom indicator. But the major advantage of the communist version was its large letters that could be read clearly from a greater distance than the small inscriptions of the US version. released that displayed their latest version. to tear more easily when the material is worked with a milling head. When the cold war ended, NASA’s type A cube was put into service again. A year 2000 photography features both the older and the newer version in comparison. Particularly interesting in this photograph (above) is the fact that two different versions of the cube were chosen to serve as a reference device. 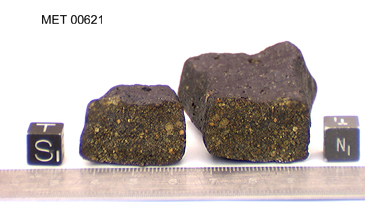 Could it be possible that the reputation of the powerful Space Agency ‘s meteorite documentation program based on the possession of just a single pair of cubes? meteorite for the time of the shot. At that time, one person entered the scene who was about to materialise the meteorite dealer’s longings for a common standard into a solid block of polyethylene terephthalate. He gave them a cube. 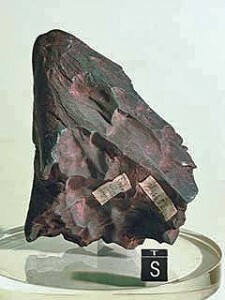 Bob Verish was the man who reinvented the scalecube for the meteorite community. His idea was as simple as ingenious. By accurately attaching capital letters stamped out of a laminated film onto the plastic cube, he achieved a striking effect. His low cost-high endurance innovation became a multi-megaseller. Until present day hundreds of images on webpages, including ours, show the unmistakable broad capitals with the distinctive convex edges. As a matter of fact the inspiration was born out of a necessity. Let’s hear Bob telling the story with his own words: “The cube-scale that appears in the LA 001 image is my first use of one. This particular cube-scale was given to me by Paul Warren of UCLA. He said that it came from NASA and is from the same mold as the other “B” cubes. Ron Baalke is a good friend of mine and I went to him for assistance in getting photos of LA 001 because it was going to be sliced-up the next day (I couldn’t take the photos myself because I had just lost my camera at Gold Basin).